Nighttimeclouds detected for the first time on Mars help to keep the planet's surfacewarm after sunset when temperatures drop, a new study suggests. Thenocturnal clouds are five times thicker than their daytime counterparts and hoverclose to the ground, almost like a fog. The study,conducted by researchers at NASA and the National Oceanic and AtmosphericAdministration (NOAA), is detailed in the Feb. 1 issue of GeophysicalResearch Letters. Martianclouds-both the day and night variety--resemble the wispy and high-flying cirrus cloudson Earth, except they are thicker andfound at more variable heights. Previous studies have detected daytime cloudson Mars as high as 62 miles (100 km)above the surface, making them the highestflying clouds ever detected on any planet. Nighttimeclouds are harder to spot. During the day, Martian clouds appear brighter thanthe planet's surface because they reflect more sunlight. Daytime clouds [image]also stand out in thermal imaging because they are much cooler than the Martiansurface. At night,these differences disappear. 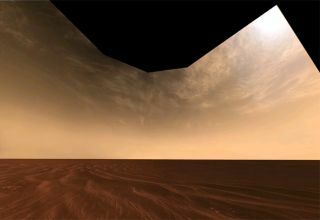 There is no longer any sunlight to reflect, andsurface temperatures drop until there is hardly any temperature contrast leftbetween Martian cloud and surface. Nighttimeclouds [image]on Mars are predicted from computer models, but none had been directly observeduntil now. The researchers discovered the stealthy clouds after investigating atemperature anomaly that occurs on the Martian surface at night picked up bythe now-lostMars Global Surveyor(MGS). "We foundthat in certain regions the temperature didn't drop as much as we would'veexpected it to drop," said study leader John Wilson of NOAA. Using the MGS'slaser altimeter, the researchers created the first map of Martian clouds atnight. An altimeter works by bouncing a pulse of light off the planet'ssurface. Depending on how the pulse behaves--whether it is absorbed, reflectedor scattered--scientists can distinguish between cloudsfloating in the atmosphere and rockson the planet surface. The measurementsshowed that the parts of the planet's surface blanketed by clouds at night werewarmer by about 35 degrees Fahrenheit than those that were exposed andunprotected by clouds. This sameeffect occurs on Earth. "A cloudy night won't be as cold as a clear night," Wilson told SPACE.com. "If thereare no clouds, the radiation from the surface just goes straight off into spacerather than being bounced back." In Mars'distant past, when the planet was much warmer and wetter than it is now, cloudswould have been more abundant and contributed to its greenhouse effect, theresearchers speculate. "The waterice clouds would be very prominent," Wilson said, "and may have had a very important role in affecting Mars'climate, maybe helping to make the planet warmer."